Verde Valley Myofascial Release is a hands on manual therapy and massage option for those who want to alleviate pain and work towards total body wellness. The company was formed by Robert Hendryx, LMT in April 2013 as a sister company to Hands On Physical Therapy in Austin, TX where Robert was a practitioner with his mother, Jody Hendryx. Side-by-side the team grew a clientele in Cottonwood & Sedona, Arizona and have since added several cities to their mobile service including: Clarksdale, Village of Oak Creek, Camp Verde, and all other Verde Valley communities. 1-on-1 care – a therapist is with the patient from the beginning to the end of each treatment. Patients have consistent care with a therapist providing treatment at each visit for 45-60 minutes. Treatment plans are individualized and customized to each person’s needs. The effectiveness of treatment plans can be assessed at each visit, and immediate changes made when needed. Integration of hands on manual therapy (including spinal structural work & advanced myofascial release techniques) with functional activities, home exercise, and patient education. A direct approach teaches the patient about their injury and their body which motivates them to be an active participant in their care and increases the probability of a good long-term prognosis. Verde Valley Myofascial Release is able to treat a very wide age range. The Myofascial Release technique specifically addresses connective tissue, which spans from head to toe without interruption. It’s a whole body technique and is effective and gentle enough for infants and elderly and powerful enough for athletes with muscle imbalances as well as everything in between. 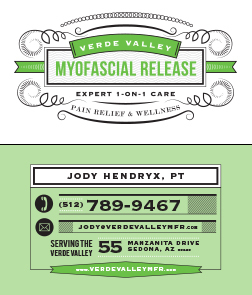 Verde Valley Myofascial Release was in need of a strong brand to position themselves away from massage therapy and focus more on wellness and myofascial release. They also needed a strong web presence, focused on SEO (Search Engine Optimization) and Social Media that people could access on cross-platform mobile devices. This, coupled with some printed brochures and banners for their trade shows and events, moved them into a new marketing space that allowed them to capitalize on Myofascial release vs. Massage Therapy. Although they offer both, featuring Myofascial Release as the flagship allowed them to use other hooks such as Massage Therapy and Dry Needling as secondary offerings. Another thing to overcome was the challenge of working in male physical therapists, as this is classically a woman-driven business. The thought was to separate the male therapists to a Sports and Pain Free Performance site that links to the Verde Valley website. This way, those potential patients would be more comfortable going to a man for these specific types of services and could have the Myofascial Release worked into their clientele’s treatment plan. In 2013 when Robert started the company with his mother, Jody, he purchased a GoDaddy Website Tonight product that allowed him to create a website and logo for himself. Though this enabled him to get going, it ended up hindering him from moving forward. Since he couldn’t control any of the SEO terms on his site he couldn’t focus on their feature, Myofascial Release. Since swapping out the old site for the new they went from page 10 on Google to page 2 in a matter of weeks. They had a successful launch at a local trade fair winning several new clients and raising awareness of what they do. They have seen a lot of buzz in the community revolving around the focus of Myofascial Release and how beneficial it is to total body wellness. 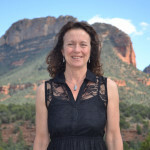 And, have since been invited to join the Sedona Chamber of Commerce, allowing them to gain exposure through the many tourism websites in Sedona that will feature the business website for Verde Valley MFR. The Pain Free Performance identity and positioning has helped the male practitioners at Verde Valley MFR to gain some ground on their female counterparts and continues to usher in people from a sports, performance, and golf background. After just a few short weeks the ROI on both websites are already proving to be of value. It will be incredibly interesting to see where they are at this time next year. We recently hired Martin Merida Design to create a logo and website for both a business we were revamping and one that we were creating in Sedona, AZ, as well as some supporting materials for both companies. I have an active MFR business in Austin, TX (HandsOn-Austin.com) and have worked with other website designers several times in the past, since our Austin company started having an internet presence. Because we are in the medical field, and are patient care oriented, we have very little technical expertise in regard to website design. Most of our past experiences with website design were frustrating and we typically found that we never really got what we wanted and paid more than expected. This experience with Martin Merida Design was totally different. Martin listened to what we wanted and made the creative process easy from start to finish. He did everything he promised. His price was more than fair and he made sure that we were satisfied with every step. When a technical issue arose, he was right there with us until the problem was solved. This was by far the best experience that I have had and would use Martin from this point forward for any creative and/or technical projects that we have for our businesses. Martin is knowledgeable and just a good guy to work with.